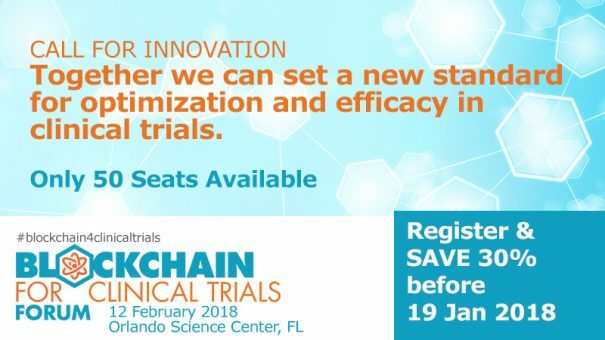 The Blockchain for Clinical Trials Forum, presented by the IEEE (Institute of Electronic and Electrical Engineers) Standards Association will take place on 12 February 2018 in Orlando, Florida. The use of blockchain technology for clinical trials stands to revolutionize the drug development process. Clinical trials will be safer, more efficient and faster, which, in turn, will accelerate innovation in healthcare. Please join us in February at the ONLY gathering of healthcare professionals to cover blockchain technology in healthcare. Why do we need blockchain for clinical trials? What are the opportunities and challenges of implementing a blockchain solution? What is the difference between public vs private blockchain application in the world of clinical trials? How will blockchain solve the patient engagement problem? How does blockchain interoperate with existing legacy platforms? How do we determine the accuracy of the patient data coming into the blockchain? What are the outstanding issues or potential benefits of regulatory compliance with blockchain? How do smart contracts offer better solutions in collaboration with patients and/or third-party providers? In addition to the educational sessions you will have the opportunity to network with leading blockchain technologists and see how data would live and interoperate on the blockchain. The forum will also host a White Board Challenge where blockchain/DLT (distributed ledger technology) reference models for clinical trials application will be presented. We hope to see you in February in sunny Orlando.